Giants play many different roles in myth and legend. These mythical beings, much bigger than people, usually have human form, but some are monstrous in appearance. Giants often seem to be cruel and evil, although they may be merely clumsy or stupid. In some myths and legends, however, they are friendly and helpful or at least neutral. Giants can represent powerful natural forces that frighten and threaten humans. In the mythology of the Native American Lakota people, Waziya is a northern giant who blows the winter wind. In some traditions, a giant appears as a symbol of chaos, threatening to disrupt the orderly natural world or social community. The evil giants of myth generally need to be defeated, either by humans or by supernatural beings such as gods. Although immensely powerful, these creatures fall when faced with bravery and cleverness. This victory of wit over brute strength occurs in the biblical story of David, who kills the giant Goliath with a stone from his sling, and in the English folktale of Jack the Giant-Killer, who vanquishes the giant Blunderbore. Occasionally, cruel and kind giants appear in the same myth. The Mensa people of Ethiopia tell a story about a man who tries to steal cattle from one of the Rom, a tribe of giants. Enraged, the giant tries to kill the man. As the man flees, another giant befriends him and hides him in his cloak. Unfortunately, the man is crushed when the two giants come to blows. Greek Giants. The word giant comes from the Greek Gigantes (meaning earthborn), a race of huge creatures who were the offspring of Gaia, the earth, and Uranus, the heavens. These giants were half man, half monster, with serpents' tails instead of legs. After Gaia became angry with Zeus, the father of the Olympian gods, the giants and the Olympians engaged in a war to the death known as the Gigantomachy. Many stories in Native American mythology describe giants with monstrous features. 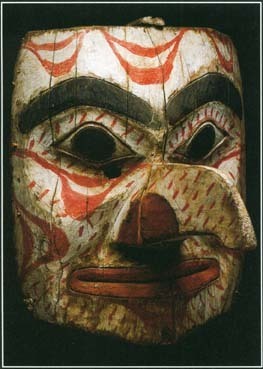 This wooden mask of a giant was made by the Tsimshian people of the northwest coast of North America. gods' victory over the giants, as the triumph of Greek civilization over barbarism, or of good over evil. Two special groups of giants, also the children of Gaia, were the Cyclopes* and the Hundred-Armed giants. The three Cyclopes each had one eye in the middle of the forehead. The three Hundred-Armed giants each had 50 heads and 100 arms. Both groups were loyal to Zeus. The Hundred-Armed giants were the jailors of Tartarus, the place of punishment in the underworld. Norse Giants. Giants appear in numerous myths of northern Europe. The giants' realm was a place called Jotunheim, located in Midgard, the center of the three-tiered Norse* universe. There they dwelt in a huge castle called Utgard. Norse myths, like Greek myths, say that the gods fought and conquered the race of giants. Yet the gods and the giants were not always enemies. Friendship and even marriage could occur between them. Male deities mated with female giants. The mother of the thunder god Thor was a giantess named Jord, for example. However, the gods violently resisted all attempts by giants to mate with goddesses. The giant Hrungir built a wall around Asgard, the home of the gods, and for payment desired the goddess Freyja. But he received only a crushing blow from Thor's hammer. Many myths concern Thor's conflict with the giants. In one tale, he journeyed to Utgard to challenge the giants. The giants beat Thor and his companions at several tests of strength but only by using trickery. In one contest, Thor lost a wrestling match to an old woman who was in fact Age, which overcomes all. Though the gods were not always good and the giants were not always bad, the struggle between the two groups constitutes one of the underlying themes of Norse mythology and often symbolizes the struggle of good against evil. Native American Giants. Most Native American giants are evil and dangerous. Some start fights among humans so that in the confusion they can steal the men's wives. Others steal children, sometimes to eat them. Many Native American giants have monstrous or inhuman features. Tall Man, a giant of the Seminole people, smells bad, while giants in Lakota stories look like oxen. The Shoshone Indians of the American West tell stories of Dzoavits, an ogre or hideous giant who stole two children from Dove. Eagle helped Dove recover her children. When the angry Dzoavits chased Dove, other animals protected her. Crane made a bridge from his leg so she could cross a river. Weasel dug an escape tunnel for her, and Badger made a hole where Dove and her children could hide. After tricking Dzoavits into entering the wrong hole, Badger sealed him in with a boulder. Some myths use giants to explain features of the natural world. For example, during the struggle in which the Greek gods overcame the giants, several fallen giants became part of the landscape. As the giant Enceladus ran from the battlefield, the goddess Athena smashed him with the island of Sicily. Thereafter, he lay imprisoned under the island, breathing his fiery breath out through the volcano called Etna. Under Vesuvius, a volcano on the Italian mainland, lay another giant, Mimas. Hephaestus, the god of metalsmiths, buried him there under a heap of molten metal. who had to die so that the earth could be formed from his body. The giant Pan Gu fills a similar role in Chinese mythology. Aboriginal people in northwestern Australia have stories about the two Bagadjimbiri brothers, both giants and creator gods, who made the landscape and people. When they died, their bodies became water snakes and their spirits became clouds. According to the Akamba people of Kenya, a giant hunter named Mwooka created the mountains and rivers. Myths from many parts of the world say that in some remote time human ancestors were giants and that they have shrunk down to their present size over a very long period. Other stories tell of giants living among people at an earlier time in history. Gog and Magog are two giants of British myth. Brutus, the legendary founder of Britain, is said to have conquered them. In Jewish myth, a race of giants lived in the world along with people before the great Flood that wiped out most living things. One giant, Og, survived the Flood by hitching a ride on Noah's Ark. Later, however, he came into conflict with Noah's descendants, and the prophet Moses had to kill him. See also Cyclopes ; Monsters ; Pan Gu .